Instagram has gone through a whirlwind of changes the past few months. Between bookmarks, likable comments, live video, tags, zoom, drafts, Stories and of course the controversial algorithmic feed – no one can argue that the Facebook-owned photo sharing app hasn’t been innovating at a rapid pace. But the real question is what effect are these product enhancements having on the bottom line – which in the case of Instagram is measured in user growth. And the answers seems to be that it’s working. The app just announced that they have grown to over 600 million monthly active users. This is almost 10% of the world population – and 100 million more than the company had 6 months ago when they announced a milestone of 500M monthly actives. As a comparison, it took about 9 months to get from 400M to 500M monthly actives – so their growth is still accelerating, even with such a large user base. While the growth over the past 6 months was still broad-based, the company noted that they were doing partially well in Asian countries – a part of the world that will be important if they want to keep up this rapid growth. And of course the product enhancements above have helped. Stories have given people a reason to check Instagram more frequently than ever before, and the personalized algorithmic feed has made sure people only see what they want to see on their feed – which also increases the chances they come back to the app. As you may recall the algorithmic feed was controversial at first – people wanted their feed to remain in chronological order, and didn’t trust Instagram to show them what they wanted to see. But now it seems that not only has this outcry completely vanished, but the personalization is actually helping with retention and growth. Of course Instagram already knew this – the same thing happened when their big brother Facebook changed from a chronological to algorithmic newsfeed. 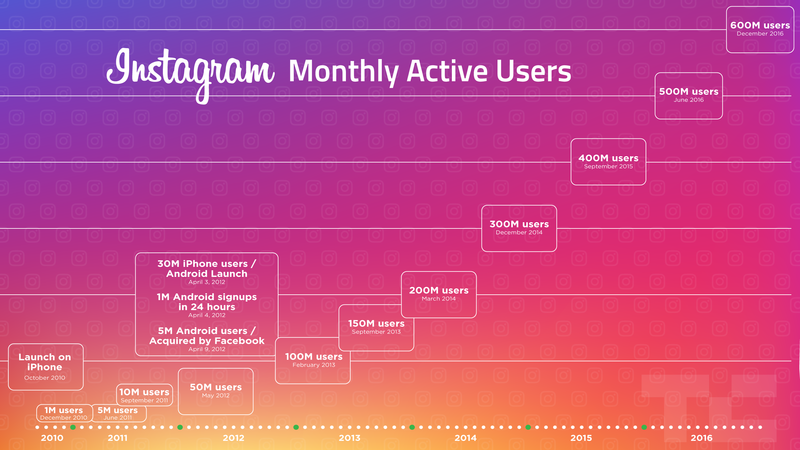 So now the question is how long will it take Instagram to hit its next 100M active users, and what product enhancements will they roll out to help make it happen faster?